Liberal M.P. Joyce Murray is bearing the brunt of a print ad aimed at aboriginal high school graduates. The offensive ad was published in the July 15th edition of the First Nations Drum - Canada's largest Aboriginal newspaper. 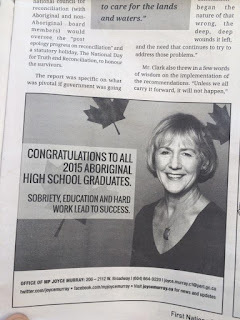 The caption " Sobriety, Education and Hard Work Lead to Success" in big bold letters next to her photo has upset First Nation communities across the country. The paper is distributed to Native Bands, Friendship Centres, Tribal Councils, Schools, Colleges and Universities, Libraries, various aboriginal businesses and organizations from east to west. Murray has released an apology on her Facebook Page for the "deeply offensive language. While accepting responsibility it turns out that she was not aware of the ad or the content. She certainly did not approve it. The advertisement was written and designed by the paper's sales department and approved by one of Murray's staffers. The editor of the First Nations Drum says the paper will print an apology and set the record straight pointing out the copy was not written by Murray's staffers. The copy certainly reflects a Eurocentric patriarchal lens through which much of our past attitudes and aboriginal policy were developed. The Eurocentric idiosyncrasy's of the past do little to transform the paradigm from colonization to respect, cooperation and partnership. I suppose the Conservatives will be generating a quick and dirty attack ad to dish the Liberals for being hypocritical on Aboriginal issues and not ready to govern - at least not yet! The newspaper copy writer who wrote the ad is a First Nations person. Nice try. Nice try - at what! Perhaps you might want to attempt to read past the headline some time..."While accepting responsibility it turns out that she was not aware of the ad or the content. She certainly did not approve it. The advertisement was written and designed by the paper's sales department and approved by one of Murray's staffers. The editor of the First Nations Drum says the paper will print an apology and set the record straight pointing out the copy was not written by Murray's staffers." The Eurocentric patriarchal scars are very much at play in this story. Is it possible that the message designed by an indigenous person would have been less offensive it it was not attributed to a white politician. There are many dynamics to this story, not least the potential for partisan politics out of situation no of Murrays doing!